The Collins Family: Where has the time gone? It seems like just yesterday that Addison was born. Now, she is nine months old! She is changing so quickly every day. She has had two teeth come in over Christmas break which brings the grand total to four. Her teeth always have a buddy. When one begins to break through the gums, the one beside it comes through a couple of days later. She is more interested in regular food now instead of baby food. 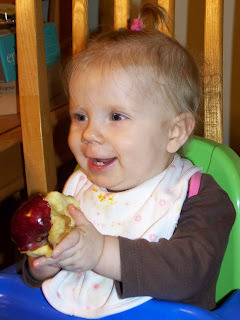 The other day, she loved gnawing on this apple. Last night, she went to town on the crust of a pizza. She refuses to crawl, only pulls herself around anywhere she needs to go. Addison has gotten really good at pushing herself up to sit. She accomplished that over the break too! She would rather stand though, and has been letting go and keeping her balance for a small amount of time. She loves saying "da da," "momma,"and "bye bye." Yesterday, she even started saying, "nuh," probably derived from the "no!" that I have had to say several times when she chomps down on me. My favorite thing is when she claps. Whatever it is about, she seems so joyful and excited about it! awww She is such a sweet, happy, and cute baby girl!! Sweet post!! She is growing way too fast! I can't believe all our babies are getting big so fast but it really seems like Addison is growing the fastest! I guess because she is a few months younger than the rest and she is supposed to stay an infant forever.... don't know, but I can't believe she is already 9 months old! Where has the time gone??? She is such a cutie!! Hope the vest fits her! 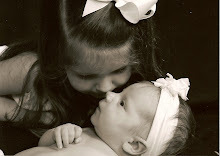 Your little girls are just adorable! Addison is growing up so fast...she is about the same age as my (great)grandson, Lane. What a wonderful age! Avery looks very happy with her new pony! Was all her "horse sense" derived from her visit with the infamous "Red Rock"?